The system will remove 15kg per year of nitrogen from stormwater prior to discharge to Ruffey Lake. The sports oval at Rieschiecks Reserve, Doncaster East, is an important community asset and is used extensively for cricket, football and general purpose recreation. This stormwater harvesting project provides an alternative source of water for irrigation of the sports oval, reducing mains water demand. The stormwater harvesting system collects stormwater in a 0.5 megalitre open water storage pond within Ruffey Creek in Ruffey Lake Park. On demand, stored water is treated and pumped under Victoria Street to Rieschiecks Reserve for irrigation. Modelling estimates that the system will achieve an 80% level of alternate water supply reliability, harvesting an average of 5.0 megalitres annually from the 28 hectare Belinda Crescent catchment located to the south of Rieschiecks Reserve. Reducing nutrient and sediment loads entering Ruffey Lake. To improve Melbourne’s water security by reducing demand for mains water. To improve water quality in Ruffey Lake Park by removing sediment and nutrients. To recycle stormwater nutrients to improve the health of sports oval grasses. To ensure maintain the amenity value of the public open space areas. 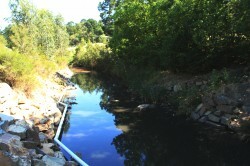 To ensure that environmental flows in Ruffey Creek are maintained. Harvesting stormwater at this site wilI improve the quality of stormwater quality entering Ruffey Lake. It is estimated that the system will remove 15kg per year of nitrogen from stormwater prior to discharge to Ruffey Lake. 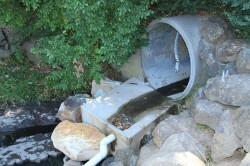 The system includes a low flow bypass ensuring that environmental flows in Ruffey Creek are maintained. The system complements the conversion of sports ovals to warm season grasses and improvements to irrigation scheduling technology, both of which will also reduce mains water demand. The ‘Friends of Ruffey Lake Park’ and local sporting clubs have been supportive of the project. The project complies with relevant legislative and environmental requirements. Community consultation and support are important to ensure project acceptance. 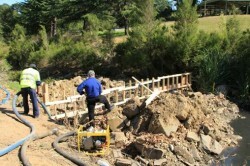 Works in waterways can only be successfully completed due extended dry periods. There are often unexpected challenges to be resolved when implementing new technologies. Clear and regular communication is essential to the implementation of complex projects. Involvement of maintenance teams in project design is important for ensuring the long term viability of projects. Accurate estimation of project costs during concept stages is important for ensuring that adequate funding is available for project delivery. The capital cost of the project was $280,000, with a payback period estimated as between 25 and 30 years.